The cycle between autotrophs and heterotrophs. There are several types of microbial growth. 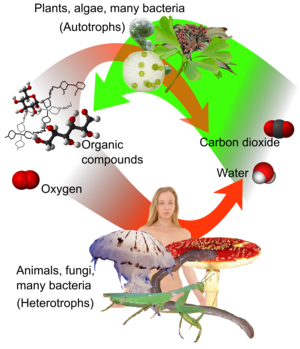 Autotrophs are organisms that are capable of obtaining all the carbon required from carbon dioxide (CO2), the main usable inorganic form of carbon on Earth. Autotrophs can get their energy either from light (phototrophs) or from chemical reactions (chemotrophs); the latter are almost always lithotrophs. The most familiar autotrophs are the oxygen-releasing photosynthesizers: plants, algae, and cyanobacteria, but many other prokaryotes are also autotrophic, being not only phototrophic like plants, but also chemotrophic. Calvin-Benson cycle (cyanobacteria/chloroplasts), purple photosynthetic bacteria (proteobacteria), etc. Phototrophs are organisms whose energy source is sunlight; such organisms are said to practice photosynthesis. The most familiar phototrophs include the oxygen-releasers: plants, algae, and cyanobacteria. These and others, like the purple sulfur bacteria (Chromatiaceae), are autotrophic, but there are some, like the purple nonsulfur bacteria (Rhodospirillaceae), that are heterotrophic. Photosynthetic mechanisms vary. The large majority of phototrophs use chlorophyll-carotenoid-protein complexes or "photosystems" to capture light. Cyanobacteria and chloroplasts have two of them, which operate in series, while other photosynthetic bacteria have only one. Halobacteria (some archaea that are closely related to methanogens) use bacteriorhodopsin, a reddish pigment related to the vertebrate visual pigment rhodopsin. Photosynthesis is a chemical reaction (or more accurately, a chain of chemical reactions) which takes place in green plants, some protists (e.g. algae) and some prokaryotes (e.g. cyanobacteria). Photosynthesis produces glucose, a carbohydrate which can then be broken down to release energy (respiration), or used to synthesize other molecules, including lipids (fats and oils) and proteins. Photosynthesis is therefore crucial to all living things (except a few prokaryotes which can synthesize molecules using energy from things like underwater volcanic vents), either directly (plants) or indirectly (animals, fungi). Oxygen gas is given off as a waste product of this reaction. This reaction is the exact reverse of the simplified respiration reaction. Photosynthesis, however, is not quite this simple and instead occurs in a multiple step chain reaction. Each step must be catalyzed by different enzymes. In plants photosynthesis occurs in organelles called chloroplasts, and the steps of the reactions are classified into "light dependent reactions" and "light independent reactions" (or "carbon reactions"). It has been demonstrated that the photosynthesis process exploits quantum physics to enhance its efficiency. These organelles contain pigments including chlorophyll (which makes plants green) and carotenids. These pigments are capable of absorbing sunlight, and the energy absorbed causes the pigment to lose an electron (energy carrying sub-atomic particle). A substantial literature on origin and evolution of photosynthesis has recently developed. The conclusion of experts is that photosynthesis similar to that used by modern cyanobacteria developed at least 3.5 billion years ago from an earlier non-oxygen evolving phase. Its evolution likely involved both lateral gene transfer between organisms and a duplication event resulting in two linked photosystems. Creationists claim that the process of photosynthesis could not have evolved since it is irreducibly complex. Answers in Genesis poses the question, "Why would evolution produce a series of enzymes that only generate useless intermediates until all of the enzymes needed for the end product have evolved?" They conclude, "It defies common sense to imagine that the irreducible complexity of photosynthetic systems would have arisen according to evolutionary theory. Rather, the incredible organization and intricacy evident in photosynthesis—a process man has yet to fully understand, let alone copy—shrieks of having been designed." Answers in Genesis also challenges the gene duplication event in the evolution of photosynthesis on the grounds that it does not add "information." They note, "It is then proposed that a 'simple duplication' of the genes encoding one photosystem occurred, followed by mutation leading to the formation of another photosystem. What is needed is new information to form another photosystem, not duplication of already present genes followed by mutation." Lithotrophs are a diverse group of organisms using inorganic substrate (usually of mineral origin) to obtain reducing equivalents for use in biosynthesis (such as carbon dioxide fixation) or energy (such as ATP production) via aerobic or anaerobic respiration. Organotrophs are organisms that gets their energy from organic compounds, usually by consuming or breaking down other organisms. Nearly all organotrophs are also heterotrophs, meaning that they also get their carbon from that source. Organotrophs include all animals and fungi, and many bacteria and protists . By contrast, aerobic metabolism involves transferring electrons from organic compounds to some oxidizer (electron acceptor) like oxygen molecules, nitrate, or sulfate. Carbon is released as carbon dioxide, hydrogen as water, etc. In aerobic organisms' energy metabolism, nearly all of the steps are anaerobic. Combination with oxygen is the last step, and one that was apparently developed or transferred several times among prokaryotes. Eukaryotes use mitochondria for aerobic metabolism; the rest of the cell is anaerobic. Not surprisingly, some organisms are facultative anaerobes, being able to switch between aerobic and anaerobic metabolism as the available oxygen varies. This distinguishes them from obligate anaerobes and aerobes, which are committed to their nonuse or use of oxygen, respectively. These considerations suggest that anaerobic metabolism was the original form, and that aerobic metabolism was later added in, which is consistent with life being present on Earth before its atmosphere became significantly oxygenated. A heterotroph is an organism which gets its carbon from organic compounds, usually by consuming or breaking down other organisms. Many heterotrophs are also organotrophs, meaning they also get their energy from organic compounds. These include all animals and fungi, and many bacteria and protists . Some parasitic, non-photosynthesizing plants, known as myco-heterotrophs are heterotrophic but not organotrophic. Myco-heterotrophy has evolved multiple times in different plant families. These plants obtain carbon from soil fungi. Interestingly, there are photosynthetic bacteria that are heterotrophs, notably the purple nonsulfur bacteria (Rhodospirillaceae). Organisms have a wide range of degrees of heterotrophy. Many bacteria, like pseudomonads, can use any of a variety of organic compounds as their sole carbon source, while on the opposite extreme, intracellular symbionts and parasites are often so dependent on their host cells for nutrition that they are very difficult to grow in lab conditions. The animal kingdom is somewhat intermediate, sharing the need to consume a variety of biomolecules, but still able to make many others. The "essential" amino acids (EAAs), familiar from human nutrition as those that cannot be made by our bodies and therefore must be consumed, are a nutritional need across the animal kingdom. Likewise, the B vitamins are enzyme cofactors that must be consumed, and for the same reason. However, many animals have workarounds that enable them to survive on diets that are short on EAAs and vitamins. A common one is gut symbionts, present in many land vertebrates and termites. Ruminants have extra stomachs before the usual vertebrate stomach, with the first one becoming a fermentation vat for the grass and leaves that they eat. A more common solution among land vertebrates, however, is making a pouch toward the rear of the gut for this purpose, the cecum. Also used are intracellular symbionts, like Buchnera bacteria in aphids. These insects consume plant sap, which is nutritionally very limited; the bacteria supply what the aphids themselves cannot. Sequencing the bacterium's genome reveals that though Buchnera is closely related to enteric bacteria like Escherichia coli, it only has biosynthesis enzymes for what its hosts cannot produce, like the "essential" amino acids. The degree of heterotrophy is correlated with the type of nutrition. The weakest heterotrophy is found in organisms of decay, which live in soil, gut contents, decomposing dead organisms, etc. ; these organisms cannot afford to be very choosy. It is stronger in organisms that consume other organisms, because those others can have ready-made biomolecules, though they are broken down into small ones before they get absorbed. And it is strongest in intracellular organisms, because they can acquire the full gamut of biomolecules from their hosts. Taiz, L. & Zeiger, E. 2002. Plant Physiology 3rd ed.. Mass: Sinauer. "Abstract: Origin and early evolution of photosynthesis." PubMed. King, J. How Plants Work. Cambridge University Press. ↑ Non-classicality of the molecular vibrations assisting exciton energy transfer at room temperature by Edward J. O’Reilly & Alexandra Olaya-Castro Nature Communications 5, Article number: 3012. doi:10.1038/ncomms4012 (09 January 2014). ↑ Swindell, Rick (Dec. 2003). "Shining light on the evolution of photosynthesis." Answers in Genesis. ↑ Purdom, Georgia (May 16, 2007). "Origin of photosynthesis: A theory out of thin air." Answers in Genesis. This page was last modified on 5 January 2019, at 04:30.